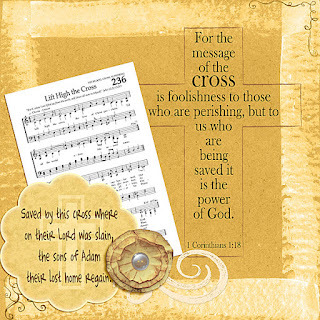 To start the year off Patter has shared an old hymn that I do not remember ever singing - Lift High the Cross. This year as I am busy with added commitments I am only making a 6 x 6 digital page for these challenges. I display them in sleeves from an album and hung on a frame that my husband made for me. I found a longer version of the hymn and liked a verse that was not included on the version that Patter shared. So that is the verse I have shared on my artwork along with a Scripture that I felt fitted the verse well. "I, if I be lifted up from the earth, will draw all men unto Me." The one thing we have to do is to exhibit Jesus Christ crucified, to lift Him up all the time. Every doctrine that is not embedded in the Cross of Jesus will lead astray. I wondered what sort of Bible Study you were doing. I went to the link, but you have to register first. We'd love to have you join us if you feel so led! Love the colours on your page and the wonderful verses. Very nice Anne-Marie. Hope all is well with you. 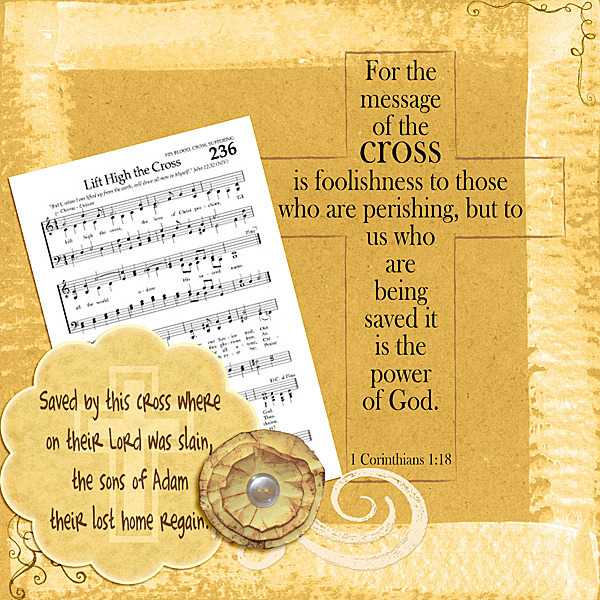 Anne Marie, I love your page and I love your scripture with the cross! Just beautiful my friend. Looking forward to this year and seeing more of what you have to share.